From Netflix to HBO Now, Google Play to PlayStation, trying to work out where you can see your favorite movies and TV shows on the web isn’t always easy. 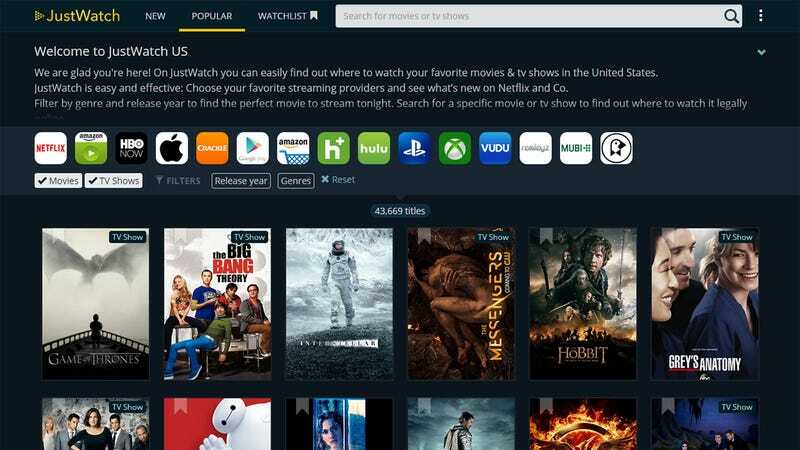 JustWatch is a slick and simple interface for searching through everything available on these services, and finding out where it’s playing. You don’t need much in the way of common sense to navigate around JustWatch, which is a relief when you’re crashing down on the sofa ready to unwind. The front splash screen shows what’s popular at the moment—you can click on any of the titles to see more details, or use the search box up at the top to find something specific. Here’s how it works. Use the filter box to narrow down your search by content type, release year, genre or service, or click on the New button to see films and programs that have been recently added (it’s a neat way of keeping track with Netflix’s constantly changing line-up, for example). Streaming services and on-demand platforms (like iTunes) are covered, and there’s even a watchlist feature that lets you bookmark items for future reference.